Frankincense – one of the oldest spices in the world, having mention in the Bible. In our days it is still used for worship in the Orthodox and Catholic churches, and is widely used in perfumery and aromatherapy. At home incense can be used as incense that creates a pleasant atmosphere in the room and well calming the nervous system. But since it is a tree resin and is sold in the form of solid pieces, people can often be difficult with his incense. Frankincense, and other aromatic resin, in itself is not a combustible substance. Therefore, its burning of incense requires an external heat source, under which the incense begins to melt and highlight of fragrant smoke that is smoked. 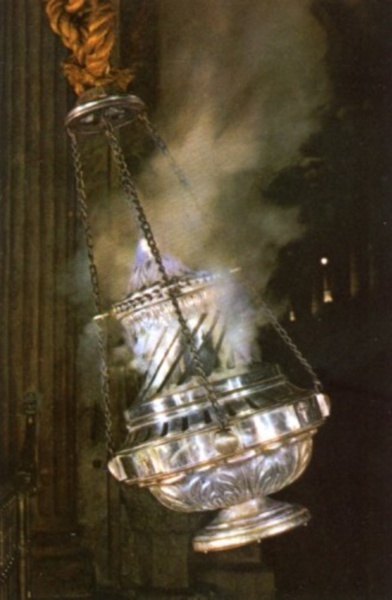 Traditionally in churches for fumigation of the premises with incense use special vessels, censers. The censor (or as it is also called a censer) is a closed metal container in the shape of an elongated bowl, suspended on chains. In it are placed burning coals, and on them pieces of incense or other aromatic compounds. The smoke goes through the holes in the censer and fumigating the room. In order to ignite the incense of the house will need a censer, a small brazier or fire-bowl, in which to put the burning coals. You can also use just a metal plate, reinforced over an open flame candles, alcohol burners or lamps. To plate or coals laid out the pieces of incense and heated up to a melting stage. It is important to remember that the less heat, the thinner the aroma of incense. As fuel for kindling the incense in house conditions it is possible to take pills of charcoal, which they sell in Church shops or stores of esoteric goods. Also suitable charcoal for hookahs. It is also sold in the form of small bars and tablets, which are convenient to use at home. The coal is ignited with ordinary matches. If you have problems, you can apply a special liquid for kindling of coal, which is sold in hardware stores. Fumigating an apartment or house incense, you need to keep in mind that its heavy flavor at excessive concentrations may cause headache and dizziness. Therefore, lighting the incense in the apartment, take care of good ventilation and do not block vents or window during the whole time of fumigation, so as not to harm the health of people present.